"The Temple Mount in Jerusalem"
The location of the Temple platform, where both Solomon and Herod's Temples once stood, has remained a mystery for almost two thousand years. There are five theories as to where the Temple was once located. The most popular is under the Dome of the Rock. The second theory shows it to be under the Dome of the Spirits just north of the Dome of the Rock. The third theory believes it was under the fountain, half way between the Dome of the Rock and the Al Aksa/Aqsa Mosque. The fourth has the Temple completely outside the Temple Mount in the midst of what used to be the City of David. The fifth is of course mine. 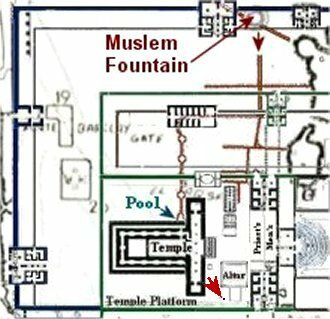 Which shows the Temple to be in the most southern position on the Temple Mount, deep below and to the west of the Al Aqsa Mosque. The first four theories have one problem in common, lack of physical proof. They feel that if they were able to excavate on the Mount then they would find enough ruins of gates and walls etc. to prove the actual location. That, however, is not allowed by the Muslims. I have found that there is a lot of physical proof, if you look to the south end of the Mount. I will be showing that physical proof in the form of pictures of the Ophel area, and old survey maps, drawn by the last explorers ever allowed to enter the underground chambers, cisterns, and water channels beneath the Mount. 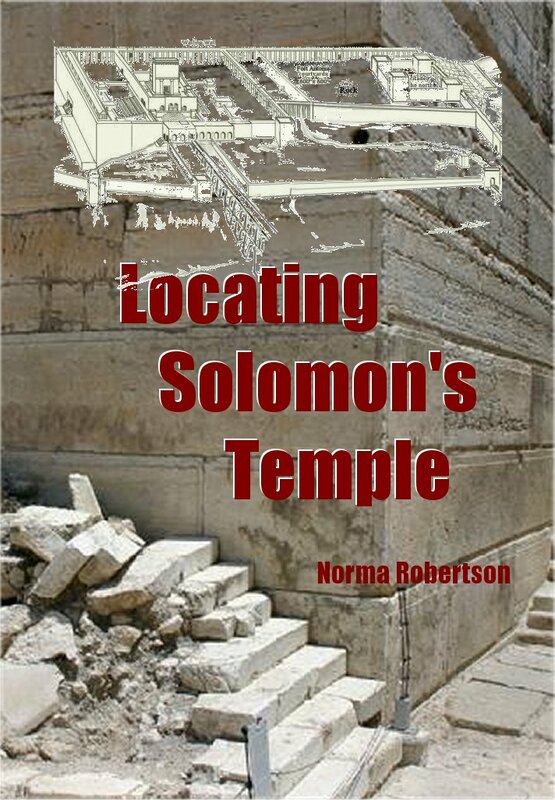 When studying about the location of the Temple of God one of the most important things to do is to begin with the location of Solomon's Temple, built around 1000 BC. Herod tore down and rebuilt the Temple on the exact same location around 19 BC. 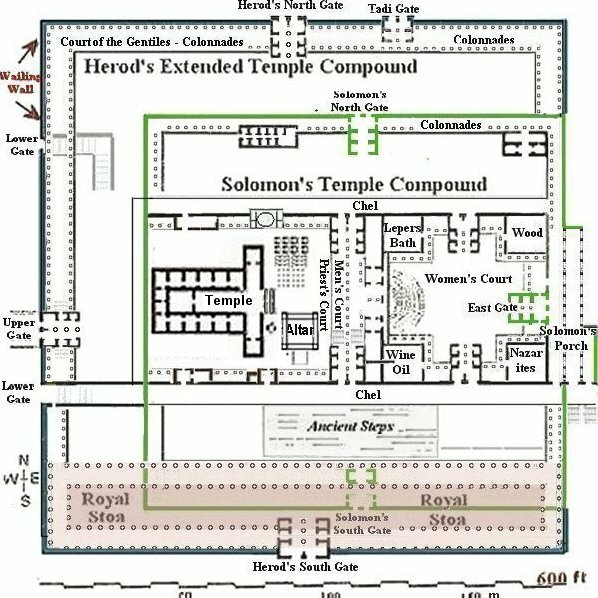 His descendants then increased the temple fortress, or complex, that surrounded the Temple House, to be double the size according to Herod's plans. These walls doubling the size of the Temple complex, constructed of first century Herodian stone, were not completed until the mid 60's. The city and Temple were then destroyed a few years later in AD 70. Josephus, a Jewish historian, lived during the time of the destruction of the Temple and city of Jerusalem, is a great source concerning the Temple. He wrote that Herod's Temple complex was a furlong in length and width. A furlong by a furlong is approximately 600 x 600 feet. This doubled the size of Solomon's Temple complex. Both Temple complexes shared the same east wall. Herod felt that the east gate was too beautiful to tear down, so refused to let his builders rebuild it. They merely extended the east wall to the north and to the south. and Herod's extended courts (in blue). The Temple house, Priest's court, and women's court were rebuilt by Herod the Great (Pre first century). 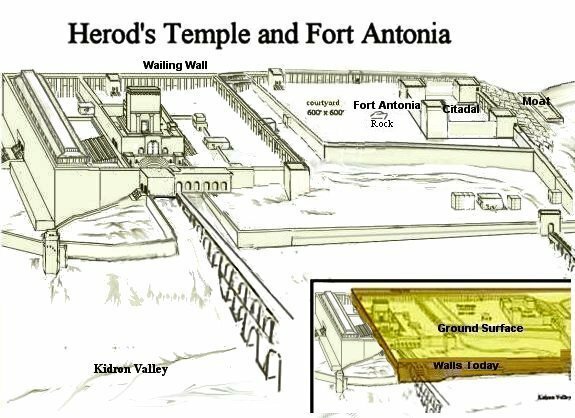 Later, as Herod's decedents continued his work by extended the outer courts during the first century, then parts of the old walls of Solomon's complex were most likely removed. Notice the Wailing Wall is located on the upper left side of this diagram on the first century wall. The Temple house, Priest's court, and women's court, were rebuilt by Herod the Great (Pre first century). Later, as Herod's descendants continued his work by extended the outer courts during the first century, then parts of the old walls of Solomon's complex were most likely removed. 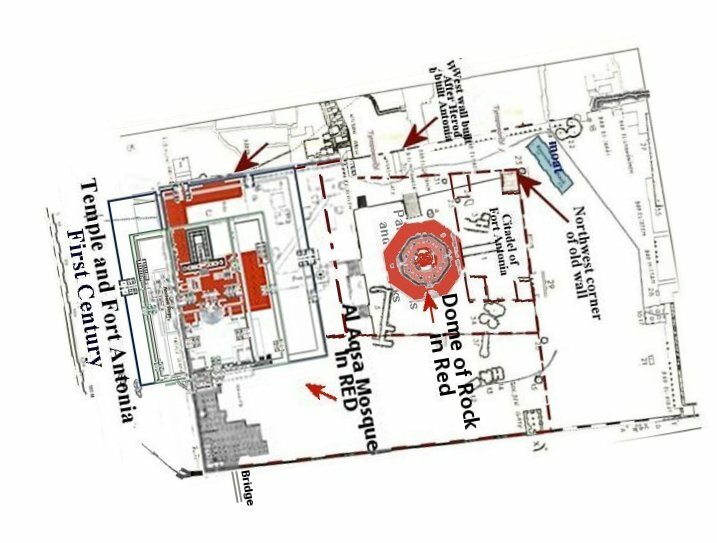 This survey map of the southwest section of the Temple Mount reveals the water channels. It seems the Muslims closed off the water channels leading to the south when they built their fountain. The aqueduct was built by Solomon bringing water to the Temple Mount from Bethlehem to the Etam pools. It entered the mount through Wilson's Arch. 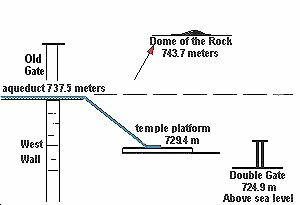 It didn't go up hill from there towards the Dome of the Rock, which would have been the case if the Temple had been located there, but instead the channel was laid towards the south, down hill from the where it entered the Mount. 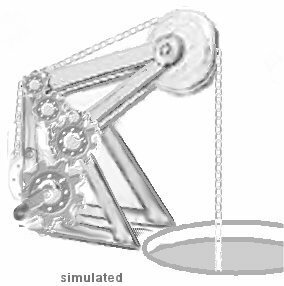 Further indicating that the Temple was located to the south. The Dome of the Rock is 20 feet higher than the aqueduct. 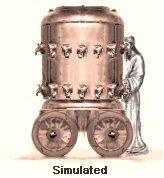 During the second temple period a new way of filling the Copper Laver was devised called the Muchni. Ben Katin, one of the High Priests who served during the era of the Second Temple, devised a system for retrieving the water each morning using this "machinery". The laver was submerged into a specially-made pool under the court. The laver was then hoisted up by the first priest in the morning. 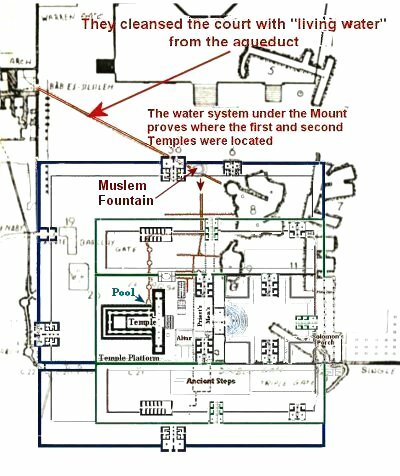 When I laid my temple diagram over the map of water channels the large pool was right next to the Temple house. This was very exciting! Another branch of this water system ended under what I believe to be the location of the Priest court. For me this was the last piece of the puzzle. This section of the water channel could be opened to flood the Priest's court each evening to cleanse it of blood. The Lower Aqueduct was rebuilt in later times by the Hasmoneans around 167 BC. An Upper Aqueduct brought water to the upper city. It was built by Pontius Pilate by the 10th legion. There was a drain next to the altar where the water and blood would have drained into a blood channel leading to the Kidron Valley. 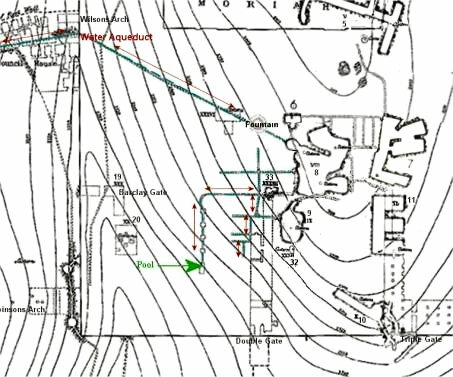 The water system also has a branch going to where the Chamber of the Hearth would have been located in this theory (Red Arrow). The Chamber of the Hearth had a Mikveh below it for the High Priest to bath. Recently photographs from 1927 have been released that show a Jewish mikveh (bath) under the Al Aqsa Mosque. It is located somewhere beneath the double passage halls below the Al Aqsa Mosque. 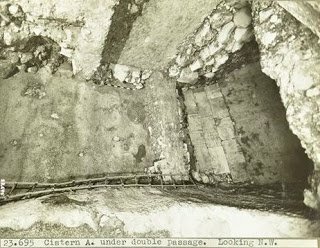 Notice the measuring rod and ladder on the floor of this Mikveh, which shows its immense size. In my theory this could possibly be the Mikveh that would have been located under the Chamber of the Hearth. Notice the comment on the photo says Cistern A. Which may indicate that there is at least a Cistern B.
Cistern A is UNDER the Double Passages, so it is at a very low rock level. 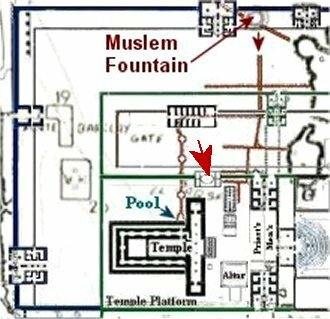 It is suspected that there is a cistern at a higher rock level, between the eastern gate of the mosque and the Well of the Leaf, that may also be a Jewish mikveh. The illustration shows the Temple situated at the south end of the Temple Mount, with Fort Antonia to it’s north. The southern court of the Temple complex extended beyond the south wall of the Temple mount, that we see today. Traces of this can be found among the Ophel ruins.